For those of you who know me, you'll know that I used to do a lot of bazaars with finished goods. Santas, bags, quilts,ornaments, you name it. You'll also know that I can't just stop at making one. This has really been a serious problem for me....I mean if I cut out one ornament, really finished 24 wouldn't be that much worse. Sometime I'll tell you all the story of my 3 ft santas, the sleighs, and the 20 special orders I took. Just know that it is another story of when I thought making 20 wouldn't be that much worse than making 5...my husband was involved cutting our sleighs and painting them many nights until the wee hours. I was making carolers, wooden horses, etc to put in the sleighs. Anyway....recently I have caught the bug and have been making binder/book covers. It always starts the same, I make one of something and think WOW that is amazing....why not make a few more for my gift closet. So here are the photos of the one finished book cover that started the most recent series of book cover mania....and also the 3 book covers that are "almost done" and I use the word "almost" really really loosely. finished cover, if you can get a closeup on the button closure...awesome button!!! Hand-made glass numbers. For sale on my website or by emailing me at qbandy@mindspring.com. Also the patterns for the binder covers should be posted soon or are available immediately if you email me (sorry not enough time to update the website because I've been sewing). Look, even a pocket for pens/pencils. 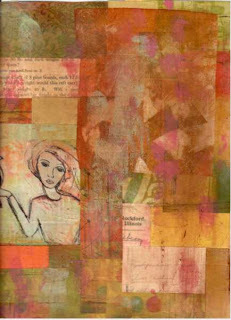 This is my art quilt journal for all of my inspiration picture, quotes, photos, stuff I've made etc. And here some more covers....also did I mention that I wasn't satisfied with the pre-quilted fabric I found.....so now I'm quilting my own for several more covers. I hope I make it through this phase of mania soon. I have "real" projects that need attention. LOL . Here are the paper collages....the originals. Now I'll print on fabric and make into journals or bags. I'm not sure. Right now I really need to finish up a quilt that needs to go to the lady that does my quilting once a year. Normally I do all of my own quilting, but having Yvette quilt for me, just the really special stuff, is like going to have a massage. I don't have to do it and she is sooo creative. 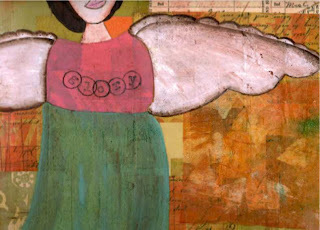 The scan at the top of the page includes a transfer that I did in a class I took with DJ....so the lady with the bird is the wonderful DJ's.....I just transferred, painted over with more greens and pinks and highlighted in a few places. This piece was actually printed on my HP inkjet then fused into the paper collage that you see. Now I'll once again print on fabric on either my HP Laser or HP Inkjet. I've been experimenting with collaging papers, using a heat press and then adding a bit of paint over the top. I then scanned the paper, applied a purple filter in Corel added some clip art and now have some cool tags to use. Take a look at the original paper scan (the color is actually much better in person). 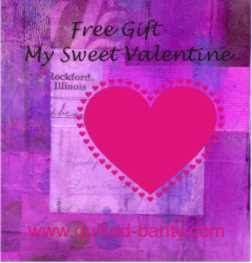 Here is the same scan, with the purple overlay, a simple piece of heart clip-art and some text. I just purchased photoshop elements so I'm hoping to be able to learn many new ways to alter original artwork. I've always really liked Corel but I'm hoping that elements, because of the availability of online training/tips, will be an even better tool long-term. The above label is to be used as part of the packaging for the free heart table mat kit. I'll get that picture posted tomorrow. I'd like to share a picture of a small table mat that I worked up as a freebie for my online quilt store (the link to the online store is in the links at the right). These things can't be complicated to make or kit.....but still have to be cute. 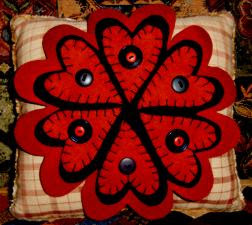 I stitched up two of these during the super bowl....so you know they are easy. I think a little table candle or votive would really look amazing in the center of this little mat. Ok, so I have to admit that I'm a bit behind on my blogging...well today when DJ http://djpettitt.blogspot.com/ posted a link from her site to mine all of a sudden I'm feeling "published". Ok, so this might sound weird but I really intended to sort of publish my thoughts but hide from everybody. This is the thing about blogging you really are "all in"...well maybe this is really the glory that I've talked of earlier. At this moment I'd like peace a little more, but I guess that is part of the vulnerability that I hesitate to share or dwell on. At you know, I've been collecting quotes and this little number really struck a chord with me. Let me know what you think. What are your new years resolutions? It boils down to what do you want more of and what do you want less of and being able to articulate those ideas and feelings in a way that at least your own brain understands. I've been thinking a lot about: "am I doing the things today that will yield the results I want tomorrow. " Really focusing on not only finding center but also grabbing a little further. As a good friend of mine said "I don't wish you peace my friend, I wish you glory", peace is too easy, glory is harder but the rewards greater. On the creative front, I've been trying to finish some projects in my studio. It is always a balance, taking on something really large and hard or something smaller that will create more generative creative thought. In some ways I have purposfully worked on larger projects, through that process it has allowed me to find true patience. Really slowing down and enjoying the process but still being focused on an outcome, a finishing point. I love DJ Pettitt, she is so amazing. She gets up everyday and puts a lot of energy into the creative journey. What I'm so inspired by is that she trys new things literally everyday. She has a few fundamental techniques for finishing, like using a heat press, that she really stays true to, but the art itself and the process of construction she really varies. I think one of the things I really want more of is short little projects, where you are focusing on a technique or tools, something to stretch yourself, to wake up the creative spirit. I just got in a new book that I'm finding really inspiring. Katie Pasquini and Brett Barker have a new book called Color and Composition. I'm taking a class next year and I think this will be a good start on that week. Here is a link to the book, take a look and I'll be posting more on my thoughts for this book in the coming days. A quote for you to think about "...decide...whether or not the goal is worth the risks involved. If it is, stop worrying...." take a risk today. Ok, I got up and have to admit felt a little "blah". 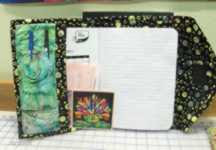 Yesterday did a bit of sewing for quilted book cover but I just haven't been feeling that creative. So this morning I got up and read one of the exercises in the "caffeine for the Creative mind" book. The challenge was to come up with a new marketing scheme for the "tents" that you see on restaurant tables. You know, the ones with pretty pictures and food items that are definetely not on the "healthy side". So I went to the gym thinking about this, hum what would be a better scheme? One thing that I could think of that would be cool is to actually allow a customer to swipe their credit card to receive email newsletter updates. Maybe actually send them e-coupons for purchase of future meals, GC, etc. This actually started me thinking about what would be effective at a printer kiosk. What could we do to actually generate more sales? Right now we have these push buttons at retail centers where a customer can print out a page to check out the PQ. This has lots of trouble as more retail outlets don't stock their printers with paper. Or in Asia and some of the brick countries they don't actually have enough shelf space to have even our smallest products sitting on the shelf. What would happen if we were able to put a swipe card in retail outlets, where we could ship the customer information. To take this idea even further, I started thinking about the recent advertising campaign that Apple and Starbucks just hosted. Bascially you go into a Starbucks, order a coffee, and during the month of October you got a printed coupon for a free iTunes download. I thought, this is probably going to be a huge hassle, so I collected my cards for the month and did the downloads all at once. It was SIMPLE. Not only that but I downloaded full albums from iTunes from a variety of the artists that I like yet had never even heard of. Now that is effectively co-ops dollars at work. Starbucks sells more because people want to know what the song of the day is so they order coffee, iTunes cashes in because the music downloads are just teasers for album purchases. Extremely clever. Hats off and kudos to Starbucks and iTunes!! In terms of being creative today on the Art Quilt side. The challenge this month is what lies beyond your creative door. 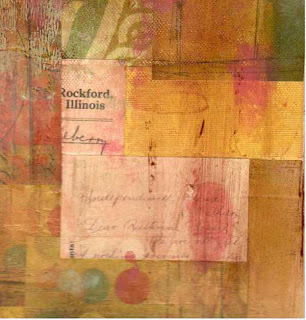 In the current issue of Art Quilt magazine they had some great images. My favorite of a hand going through a door with a needle and thread feeding through. So I've been thinking about what lies beyond my creative door. It feel like a rainbow of color and I really trying to think about how to extend my thinking beyond the hand, needle, and thread. Doing some sketching right now in an attempt to really open up my mind to the possibilities here. The hardest problems often require the most creative solutions.....you can extend that thought to every faucet of life. From engineering, to business models, to art. Ok, let's just say that I was overzealous with my ability to create tons and tons of these pear studies. Also, a bit overwhelmed. The thing I learned with this exercise is that you don't have to have a million pieces in order to create something that looks very life-like. Also, keeping to a regular "pear" color scheme is boring boring boring. Thus the psychodelic pear. I did do a pieced foundation for another pear block and am eager to see how that looks, but have just been buried this week at work. Last night at Art Quilt Group one of the ladies, Amy, followed some instructions on how to dye black fabric using bleach in a bottle. very cool and out of time this morning. I had to laugh as the last time that I blogged was when I returned from DJ's class in Arizona. Well, now I've just returned from Art Quilt Tahoe. There is probably a connection with when I'm feeling most creative and when I blog. Hummm. 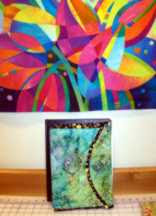 At Art Quilt Tahoe I took a class from Sue Benner. What I enjoyed most about the class was her approach to teaching. It had a real "university" sort of feel. Where she lectured, then brought in the Art History part of the material and then gave us an assignment. I started the week feeling pretty bulish about my ability to create art in an abstract way with scissors and gobs and gobs of Wonder Under, in the middle felt totally incompetent about my Art Quilt Abilities, and then at the end hopeful that I'd practice and refine everything that I learned for the week. Call me a fraidy cat, but I'm not posting the pictures of my work from the week. It was scary. When I got home, my sewing room was totally avoided as I didn't want to face the unfinished project from this class, the thing really needed the waste basket not more wonder under. After ruminating about it for several days, the project was thrown away and plans in place for a much simpler undertaking. In my Art Quilt Workbook, they have this simple pear. I think that I'll practice layering techniques with a much easier project. The thing that I was really struggling with was how to build the background. Many larger pieces, smaller pieces, what technique would you use and what effect would each technique actually produce? Art Quilt Group is Thursday night, so I need to get working on some options this evening for that Pear. I think that I'll try one background, then pear provided in the workbook. Then do a scrappy back pear, with pear from the book, how about one fabric back and scrappy pear, scrappy back and scappy pear. Then I'd LOVE to cut up one of the compositions and see what you get with refusing. Giving myself a time limit of saying 10-15 minutes per composition is probably a good goal. I'll probably pick out 5-8 FQs size pieces of fabric and try to make all compositions from these materials. I'll post what I have tomorrow. Something else really has been bothering me, which is effective use of HTML as a markup language or using a more intuitive product for website design. I will do some research on tools and approaches but it feel that my skillset, although it still works, is a bit behind the times. Should be simpler to make mods to my website that it is and I'm thinking that a bit of research would make me much more effective. Other crazy ruminations are effects of the global economy on not only large scale businesses but how do small businesses actually connect with this trend of a more global economy? This is vexing me right now. 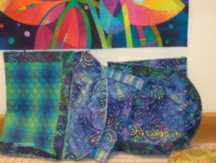 I need a place to post the pictures from my art quilt group and also to post some of the cool pictures from the classes I took in Arizona from DJ Pettit and Traci. So here is my first go of it. Of course, one always has opinions of new tools, software, trends, etc. and this is going to be the home of all of that.